Chinese Smartphone Company officially announced in 11 August, 2015 launch new generation smartphone ZUK brand Z1 with FPC touch sensor feature FPC1155. Already received as well as expected revenues in 2015 that relate to sales of FPC1155 for this smartphone model are included in FPC’s communicated revenue guidance of approximately 2,200 MSEK for 2015. 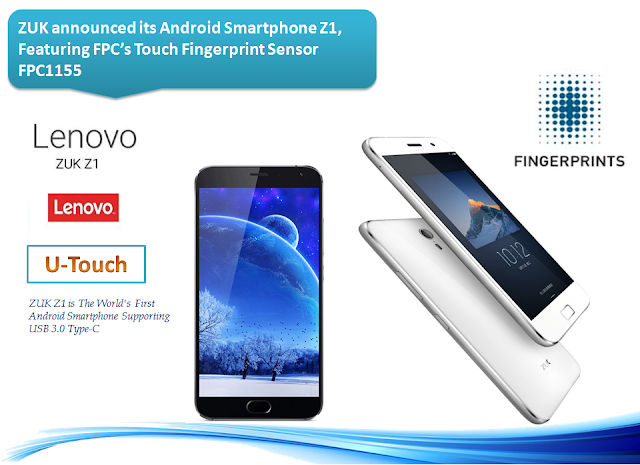 Z1 Smartphone has following power-users features such as robots quality FPC’s fingerprint sensor, U-Touch button on home combining home, back, menu, app switching and multi-tasking into one single button and Qualcomm Snapdragon 801 processor, 64GB eMMC storage, 4100mAh battery and a USB 3.0 Type-C port. FPC1155 offers excellent 3D pixel sensing technology that reads virtually any finger: dry or wet. With a robust surface coating, it is capable of more than 10 million finger placements and withstanding daily wear-and-tear. FPC1155 touch sensors offers secure and convenient user verification, while Guided Enrolment software increases the accuracy of captured images for an improved user experience.